Beautifully handcrafted in best quality silk sourced from China and handmade in Kashmir by our talented weavers. This is a Handmade Kashmir Pure Silk on Silk rug. This rug is Handmade in silk base and pure Kashmir Silk on top. Number of Knots in this rug are 576 knots per square inch. The design has been originated from one of the oldest towns in Persia called Kashan. 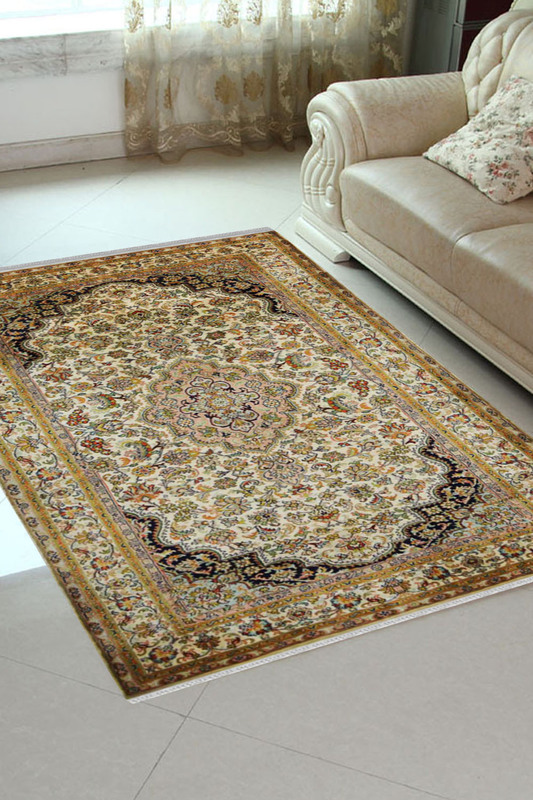 The majority of Kashan's have a similar design with a central medallion and Persian floral motifs forming the pattern. The main colors of this rug are cream, ivory, gold with hints of dark blue on the four corners. The detailing of the drug makes it a majestic one and would add richness to any space it is placed in.